July 9, 2010 - Bald eagle in flight. We hiked the 5 mile Goat trail, starting at the base of Horsetail Falls and climbing rapidly to the base of a splendid water body. Lunch was had and plenty of photo-ops exploited. 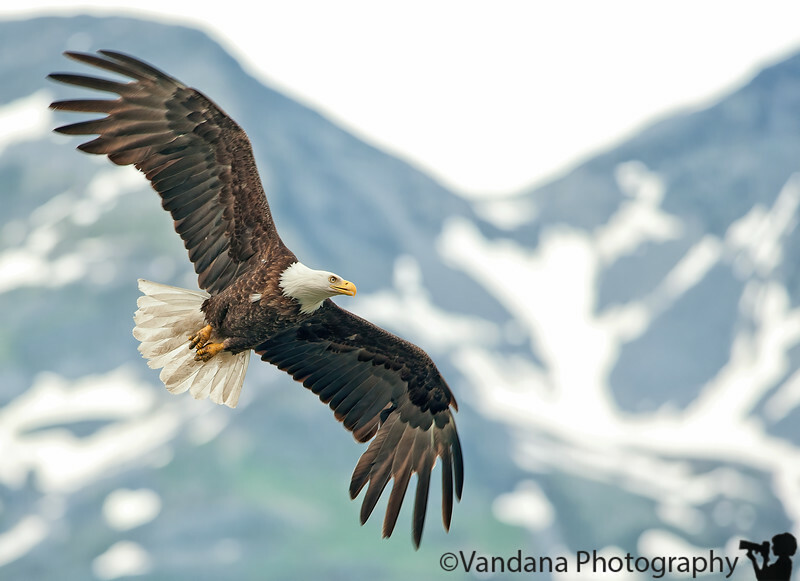 However, the highlight of the day was the stopover on the shores of Valdez at the Solomon Gulch Fish Hatchery , frequented by bald eagles, juvenile bald eagles, and a ton of seagulls flying against the gorgeous backdrop of snow-crest mountains. Beautiful capture - lucky you! Great sense of space in which the eagle is caught in. What an amazing capture...you must have been ecstatic when you saw him. Awesome shot, perfect timing. No one does these in flight captures consistently better than you.